View More In Label Makers. LabelManager 280P delivers labels faster with time-saving features. Customize labels with any fonts and graphics on your computer through PC or Mac connection. Type text quickly on the computer-style (QWERTY) keyboard with country-specific layout. Avoid the cost and waste of disposable batteries with the included rechargeable battery pack. Edit text easily with one-touch fast-formatting keys. 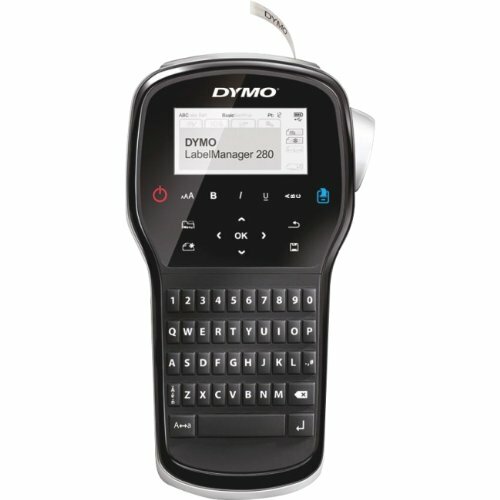 Label printer prints fast and uses Dymo D1 labels in 1/4"", 3/8"" and 1/2"" widths. Display size is 14 characters x 2 lines. Maximum print height is 22.7 point. LabelManager 280P also features a manual tape cutter, three fronts, six type sizes, seven styles, 221 symbols, repeat printing, auto numbering, and mirror/vertical printing. Label printer includes a charging cable, and black/white starter D1 cassette.